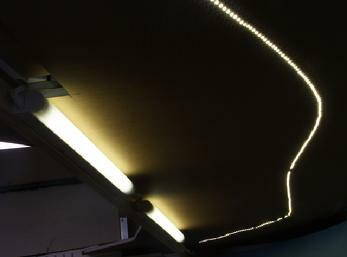 LED lighting attached to bootom of upper deck (fascia removed to show lights). Picture is intentionally underexposed to make lights clearer. Lighting of the lower deck on a multi-deck layout can be problematic. Typically under cabinet fluorescents are used. This typically adds about 2-3 inches to the thickness of the upper deck. The fluorescents produce heat and finally they interfere with switch machine placement. For some time I have been looking for an affordable LED alternative. There are a number of bright white LEDs available but until recently the ones I looked at were impractical or too expensive. 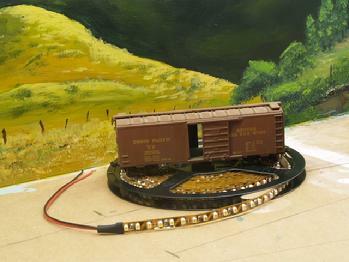 For example, loose bulk LEDs are impractical because hundreds of them are needed. The effort requiring for wiring and soldering hundreds of LEDs is daunting. I purchased two rope lamps made of LEDs but found that the light they produced were too blue and produced unnatural looking colors. Recently I stumbled upon a reference to some warm white LEDs in a bulletin board. 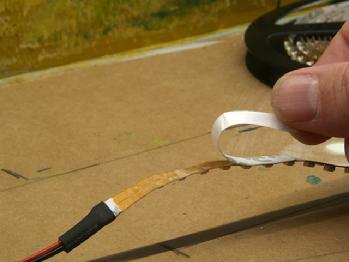 The LEDS are surface mounted LEDs attached to a flexible PC board that forms a long tape with an adhesive backing. After purchasing these, I found that the LEDs appear to use a phosphor to extend the spectrum in to the yellow and produce a light that is pleasing to the eye. The lights are easy to apply. After peeling off the paper covering over the adhesive back the LED strips can be directly stuck to the bottom of the upper deck. Alternatively the can be attached to the backside of a thin fascia. The LEDs have a dispersion of 120 degrees. 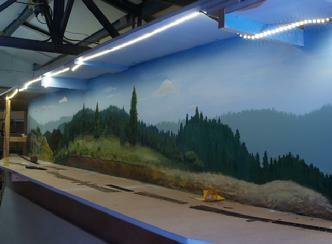 The LED strips are 15 feet long and come in a density of 300 or 600 LEDs per strip. I found that the 300 LED strips were too dim and the 600 LED strips are comparable in lighting to 13W under cabinet fluorescents. If the LEDs are placed about 12-18 inches above the lower deck they do a good job of filling in the shadow formed by the upper deck. Comparison of LED lights to 13W under cabinet fluorescent bulbs. LED lighting as it comes on a 15 foot reel. 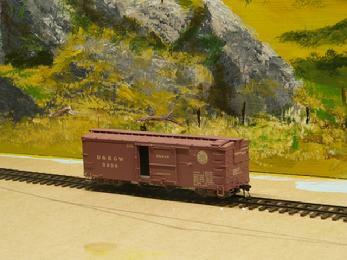 HO scale boxar shown for scale. In my lighting scheme, I use a ceiling mounted 2-tube 4 foot daylight fluorescent to light the upper deck and the outer edge of the lower deck. This leaves a shadow that needs to be filled in. The LED lights do a nice job of doing this. For lighting a deck with LEDs alone I think I would go with 2 600 LED strips mounted in parallel. You will need a 12V power supply. I used a 12V 3 Amp switching power supply. Ideally I should have used a 4 Amp power supply but I found that I couldn�t tell the difference in brightness between using a larger power supply so the switching supply I bought is putting out more than its rated current or the difference in brightness is not apparent to the eye.